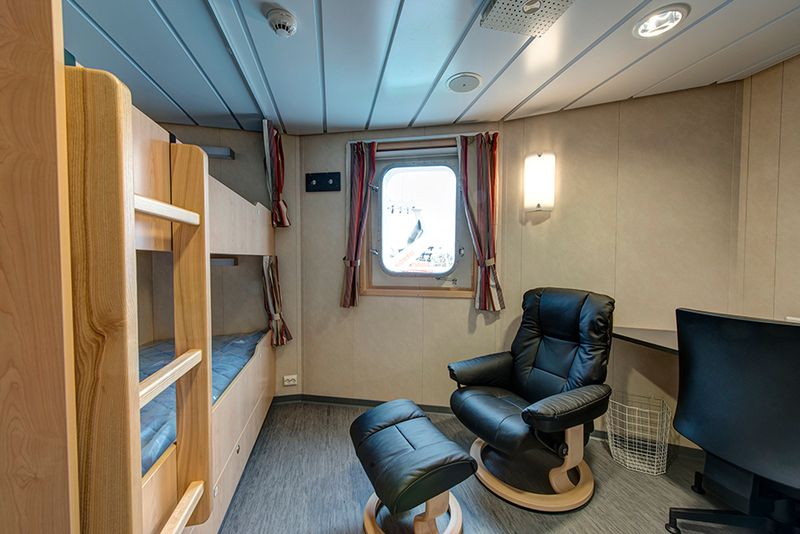 The passenger cabins on a cruise vessel are designed to offer comfort and relaxation to the residents. On the one hand, the passengers should be made to feel comfortable in their holiday quarters, but equally, it is important that an effective lighting system enables them to enjoy their various activities in the cabin during the course of the day. From getting dressed in the morning to reading a book before switching off for the night, the appropriate lighting setup makes life on-board easy. 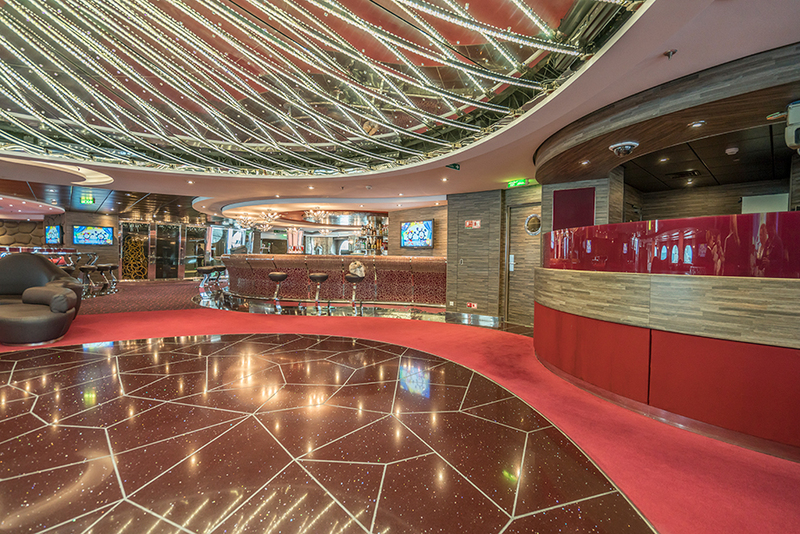 Suites and penthouses on a cruise vessel are designed to offer an exclusive atmosphere to the residents. 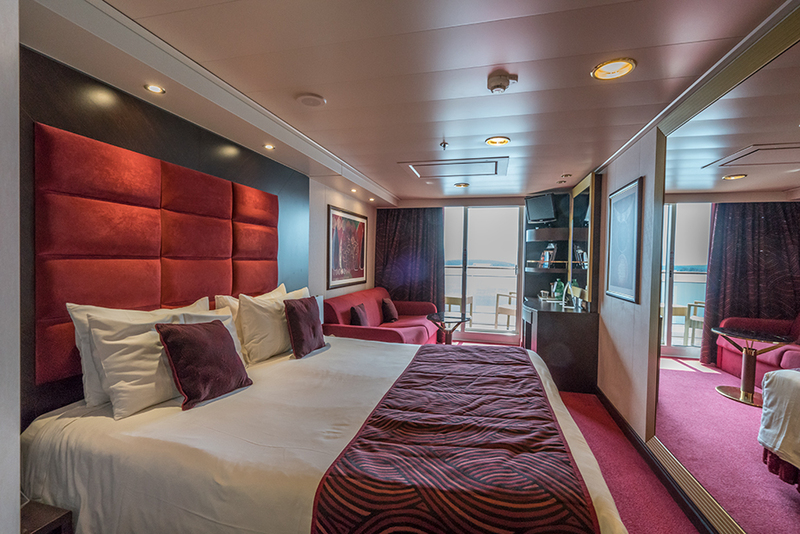 Whether it is on the balcony/terrace, in the sitting room or in the bedroom, the passengers should experience a high quality leisure environment in their holiday quarters. Equally, it is important that an effective lighting system enables them to enjoy their various activities in the suite during the course of the day. From getting dressed in the morning to reading a book before switching off the lights at night, the appropriate lighting setup makes life on-board easier and more relaxing. 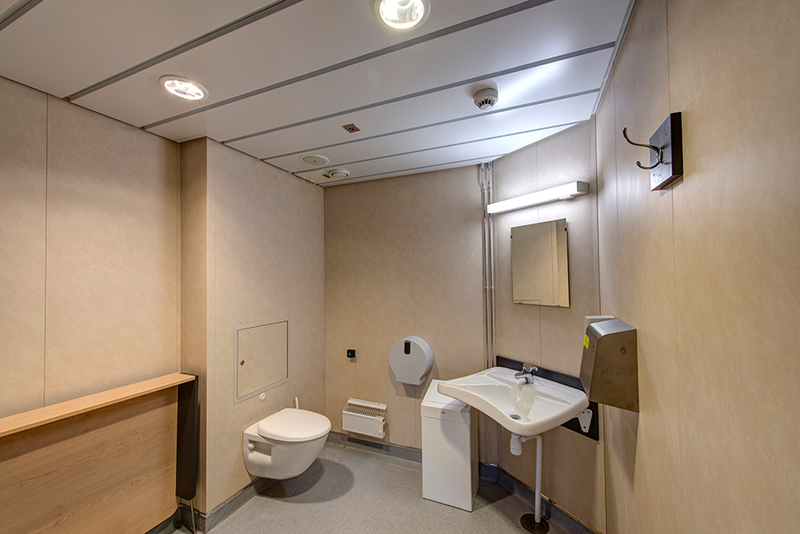 The bathroom for passengers combines functionality and comfort in one package. Not only should passengers feel comfortable in the room, it is also important to ensure the quality and water-resistance (IP-grade) of the light fittings. 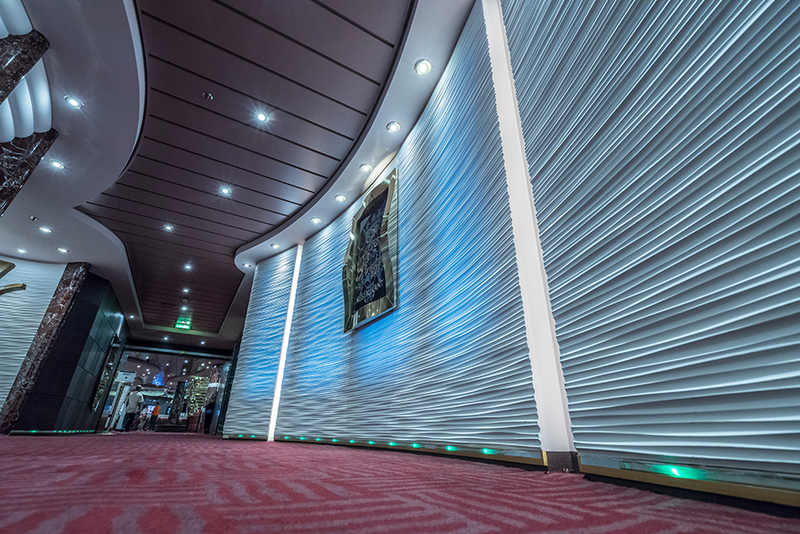 Lighting installed in passenger corridors on a cruise vessel must be designed to provide a combination of functionality and safety yet still match the overall design. Lighting in corridors is often not given sufficient consideration. 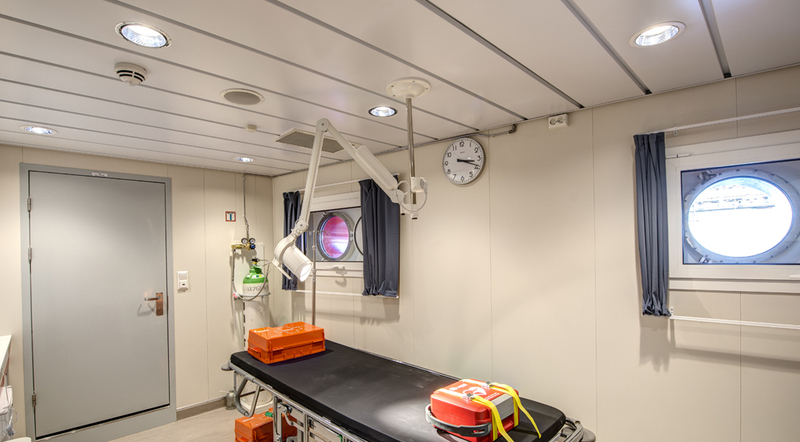 The function of corridors is not only to provide connections between rooms or different areas of a ship, but they must also function as primary escape routes in cases of emergency. 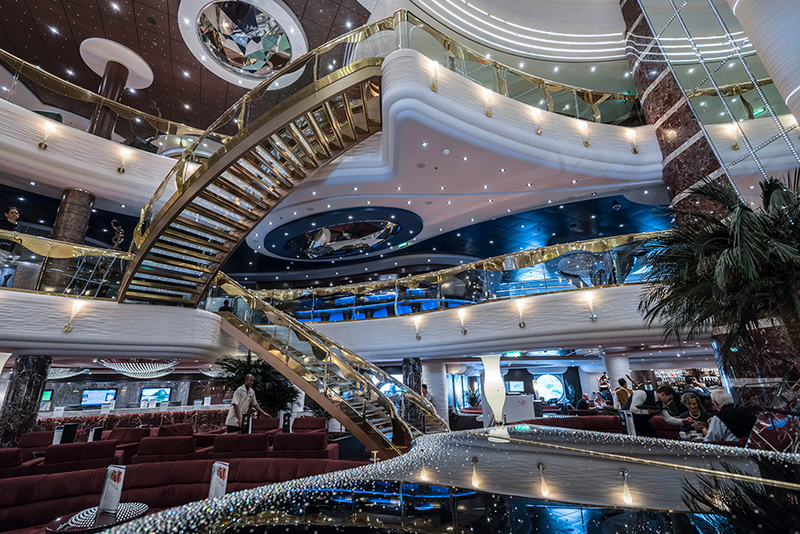 Lighting installed in public staircases on a cruise vessel must be designed to provide a combination of functionality and safety yet still match the overall design. Lighting in staircases is often given insufficient consideration. 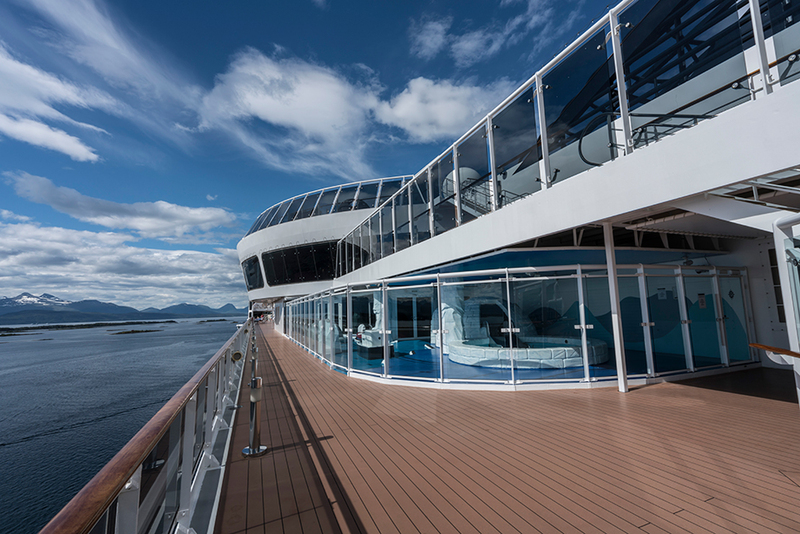 The function of a staircase is not only to provide connections between the different decks of a cruise vessel, but they must also function as main escape routes in case of emergencies. Dining on a cruise vessel is a joyful celebration in the truest sense. To amplify this experience with all senses, the lighting installations in a restaurant or dining area should provide atmospheric lighting and turn the location into a cozy, relaxing ambience. Following its use as a dining area for passengers, the process of then rearranging tables and cleaning the restaurant areas requires a very different lighting scenario with higher brightness in all corners and a light temperature of 4000 Kelvin. 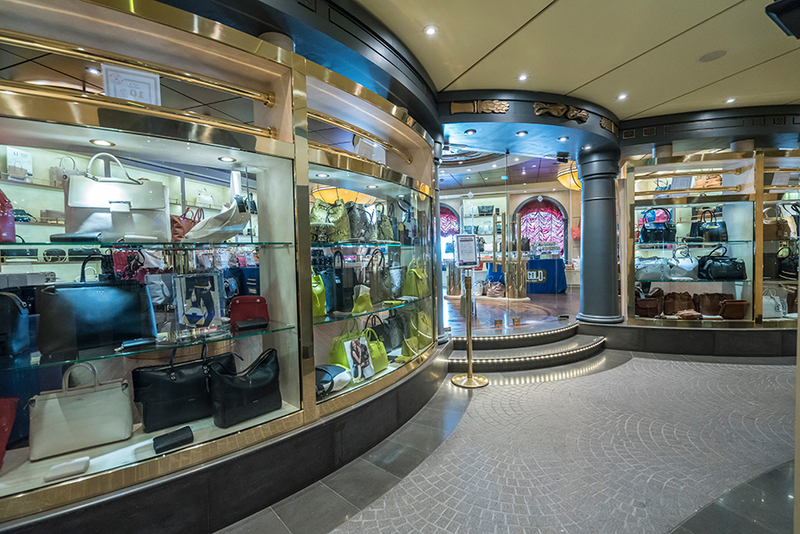 Most large cruise vessels have several shops, usually placed together in an on-board “mall” area. Some vessels have even more designer boutiques with brand-specific design and lighting setups. All light installations have a common goal of presenting their featured products in a perfect style and to support the passengers in their shopping process. Whether it is in the shop or in the mall walkway, the light sceneries should complement the interior design language with direct or indirect lighting or spot beams to focus on special deals. 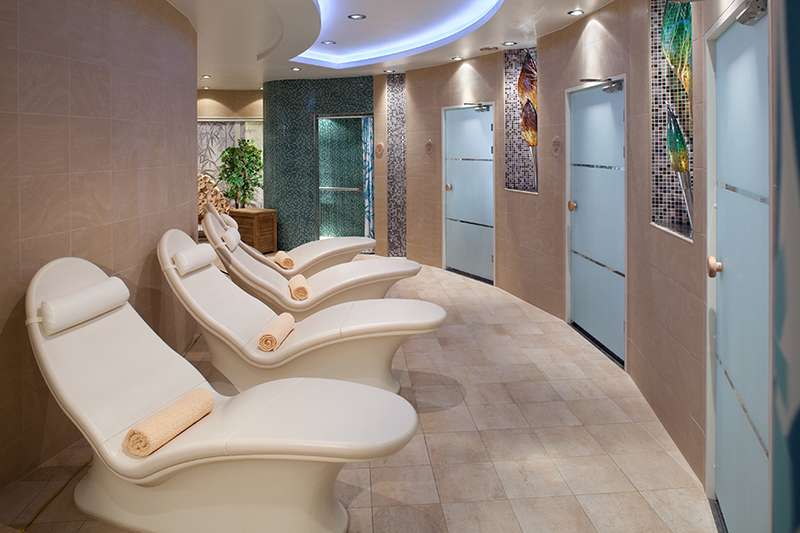 Almost all cruise vessels have a spa complex, often including a gym facility. Health and physical fitness are becoming more and more important for people and with the variety of food offerings on-board a cruise vessel, the spa and gym offer an excellent balance for the passengers. Forgot to bring a book with you? Or has the battery on your electronic reading device just died? 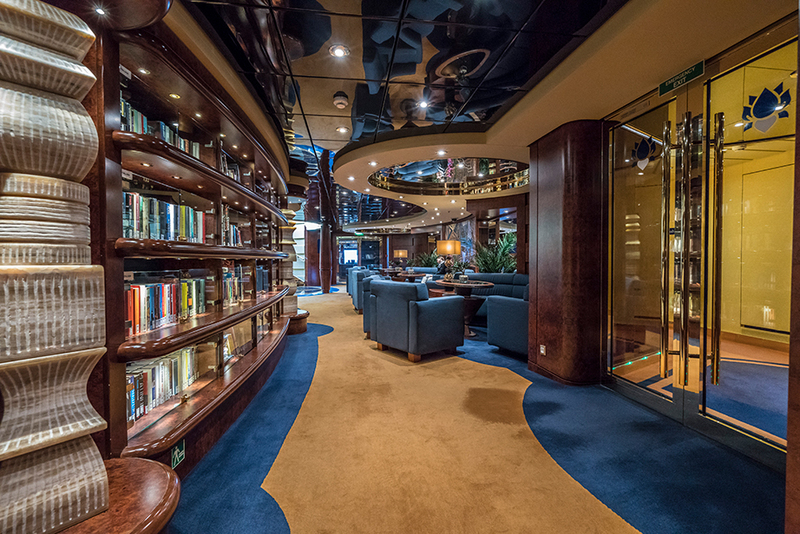 Almost every cruise vessel has an on-board library stocked with the good stuff. For the silent types, it’s a great place to read, but if the roar of the ocean is more your soundtrack, the library is a great place to find a good read to devour on the sun deck. All big cruise vessels come alive at night. When the music is turned on, night owls enjoy dancing on the dance floor or sip their cocktails in the lounge seats. There is almost no place on-board where the variety of light scenes is so varied than a dance club. Successful meetings start with the right environment. 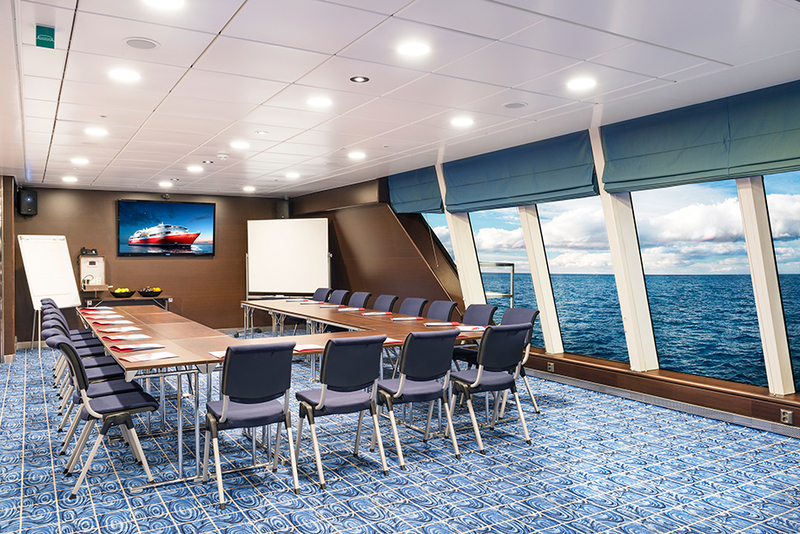 A board retreat, a national sales meeting or a pure incentive program – the meeting facilities can accommodate all kinds of events on-board a modern cruise vessel. The right lighting installation in a conference room supports meetings, presentations or receptions with the appropriate light scene. 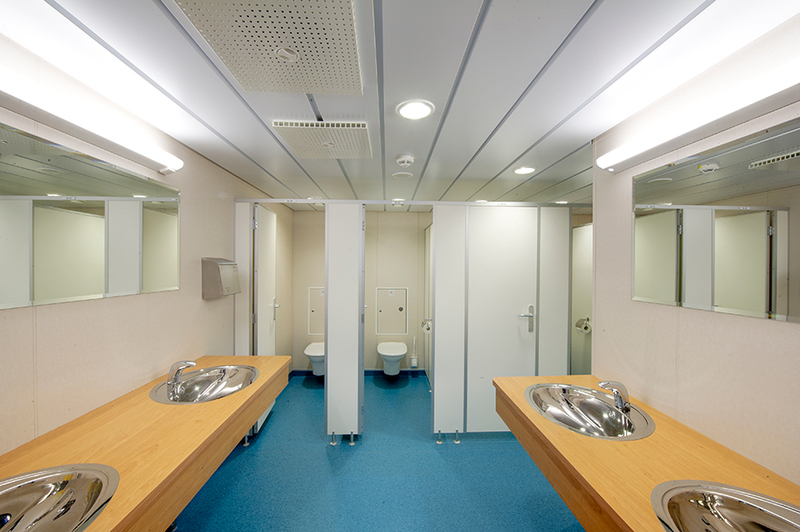 The hospital on a cruise vessel is designed to combine functionality with hygienic aspects. The hospital staff must be able to differentiate between different colours and must be provided with bright lights in order to see fine details. Public toilets are often located in the vicinity of areas such as restaurants, theatres, casinos or shops. They should provide clean, safe, accessible, convenient and hygienic facilities for the public and an appropriate level of privacy. Lifeboat stations, life raft stations and assembly/meeting points are provided on cruise vessels in case of emergency situations such as a fire or if the ship is in danger of sinking. As with all other areas, rescue areas also have particular demands on installed lighting equipment. The required lighting solution must operate in all weather conditions and should also provide a safe working environment when maintenance on lifeboats and davits is being carried out. 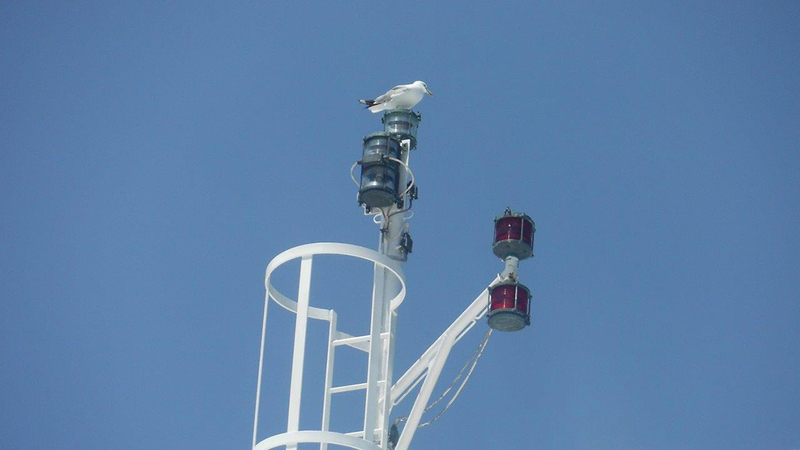 As with all areas on-board a cruise vessel, outside areas have special demands on the installed lighting equipment. The required lighting solution must operate in all weather conditions. A good lighting solution will also provide a safe working environment. The promenade deck is a location found on almost all cruise vessels. It normally extends from bow to stern on both sides and includes areas open to the outside, resulting in a continuous outside walkway suitable for walking or jogging. Usually, the promenade deck is the embarkation deck to man the lifeboats in emergency situations. 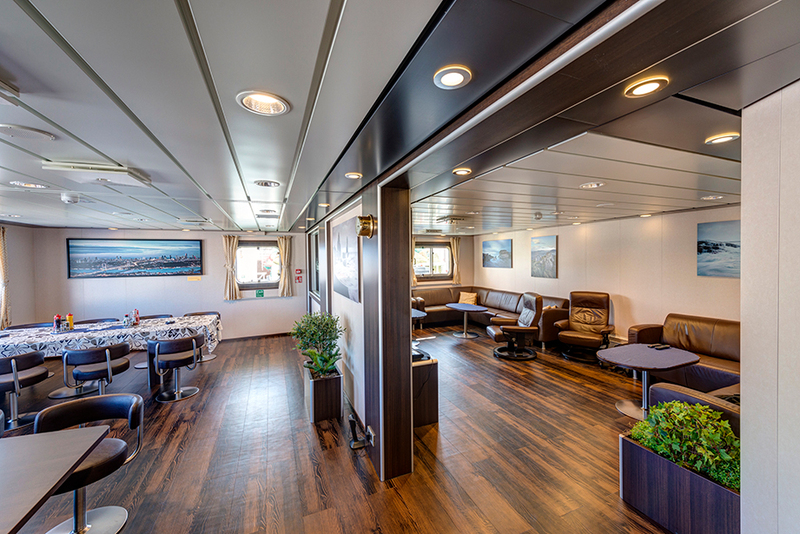 As with all areas on-board a cruise vessel, the promenade deck has special requirements for installed lighting equipment, regardless of whether the area is for work, embarkation, rescue or winching. In addition, the visibility of the vessel itself and its surroundings also have to be considered. The required lighting solution must operate in all weather conditions. A good lighting solution will also provide a safe working environment for the crew. These days cruise vessels are a lot more than just family pools and spas. Passengers find straight up water parks and swimming pools that will bring out the kid in everyone again. 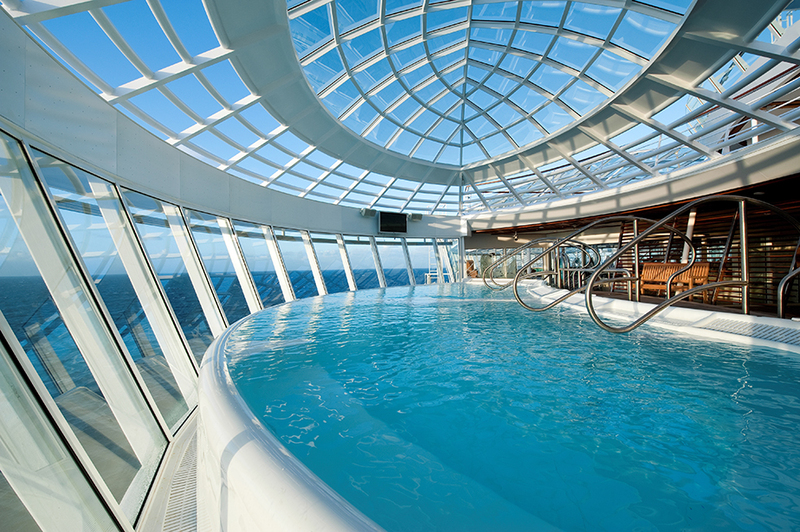 As with all areas onboard a cruise vessel, pools have special demands on the installed lighting equipment. The required lighting solution must operate in all weather conditions. 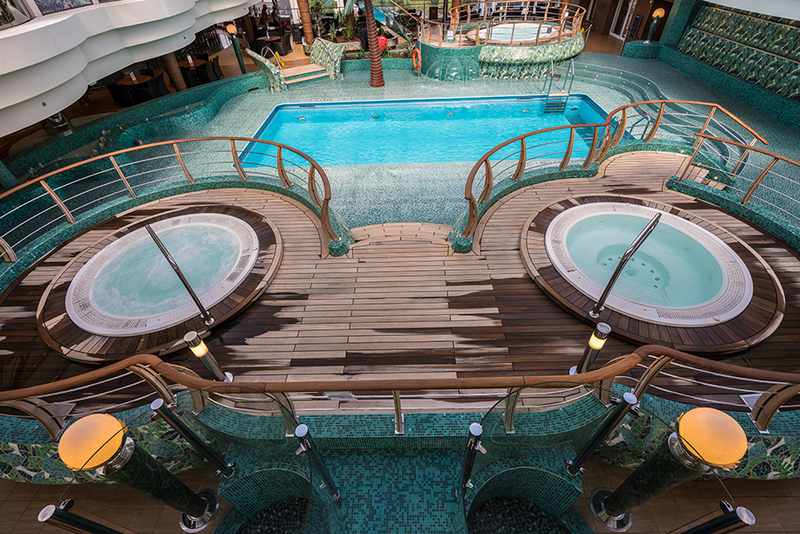 Cruise ship sun decks have always been popular hangouts for passengers, but the original “one deck, one pool” mindset of the 90s has changed tremendously. Cruise lines are designing pool areas that mirror land resorts, the best of which have always offered fabulous pool and sun bathing areas. 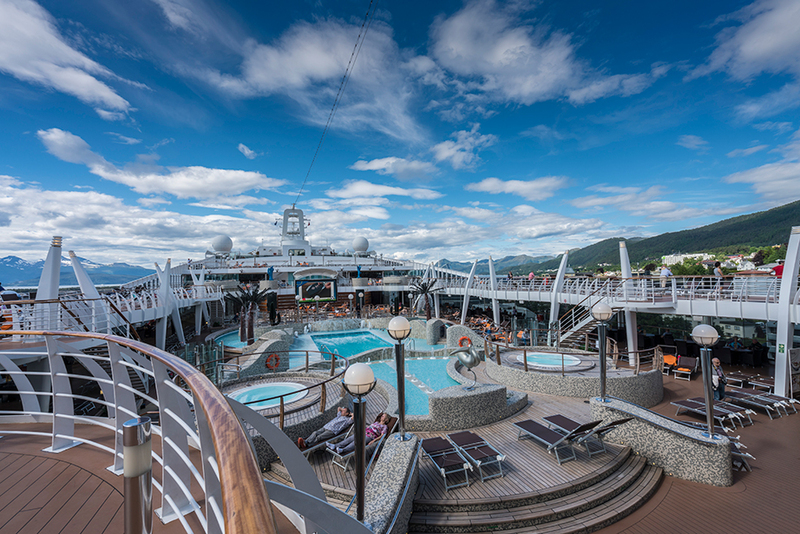 Many of the cruise vessels also feature outdoor cinemas at the pool areas. As with all areas onboard a cruise vessel, pool areas have special demands on the installed lighting equipment. The required lighting solution must operate in all weather conditions. A good lighting solution will also provide a safe working environment. When using LED strips for decorative lighting around pool areas, an IP class of IP68 should be used. To avoid collisions, cruise vessels must be equipped with navigation lights (running lights) that allow other vessels to determine the type and relative angle of a vessel and thus decide if there is a danger of collision. In addition to the running lights, the vessels must indicate special conditions, e.g. being at anchor. The required lighting solution must operate in all weather conditions. The officers and staff working on the bridge are exposed to natural daylight during the day but are also in need of night vision light fittings when the vessels are operating in hours of darkness. When the ships are docked in a harbour, daylight lux levels are required. This means there is high requirement for special features for light fittings installed in the bridge. In most situations, the crew in a control room works without natural daylight and so light quality is very important. Lighting is a critical factor in ensuring a safe working environment. The lighting needs to be reliable and the luminaires must achieve the required level of light intensity. However, there is much more to lighting than light distribution and intensity levels; the crew should feel comfortable in their working environment and the lighting should help them remain focused while working. 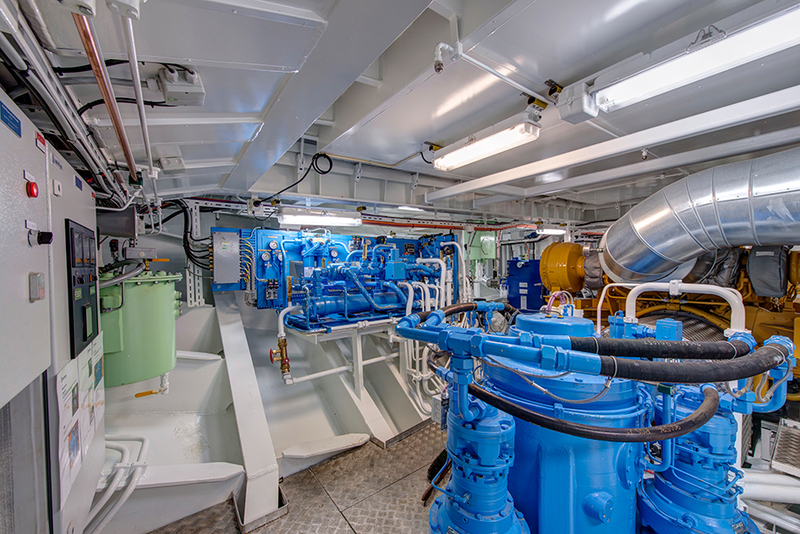 The crew in the engine room works without any natural daylight and so the light quality is particularly important. 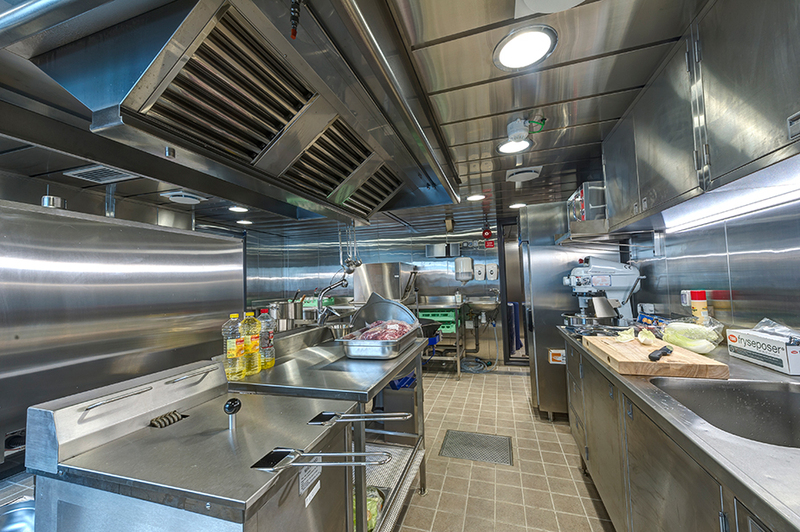 The Galley is a 24-hour working department on-board a cruise vessel. During the course of a day, many thousands of meals must be prepared and delivered to the various on-board restaurants. 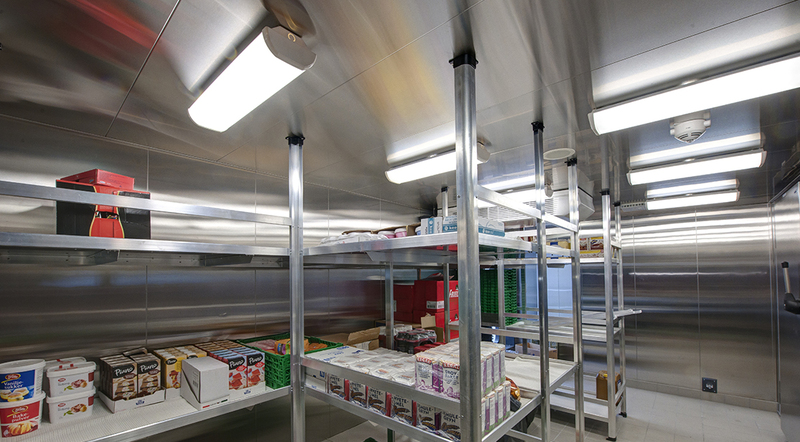 Lighting in galleys and pantries should provide a safe working environment by achieving a certain level of light intensity, a good colour rendering and colour temperature. The lighting needs to be reliable and the luminaires must be maintenance-free. 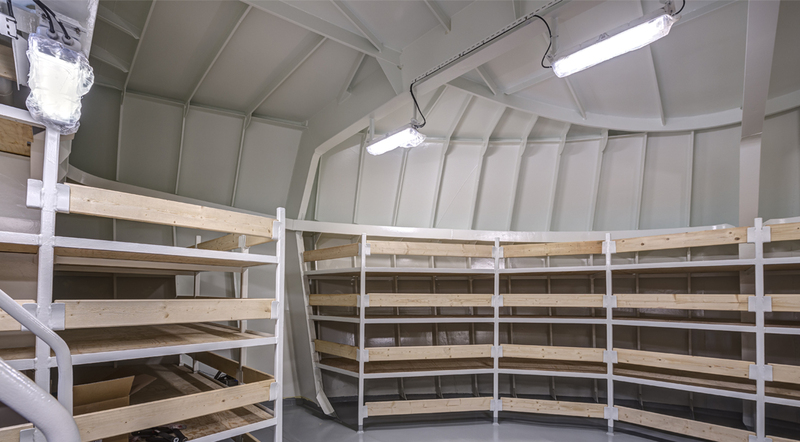 In ship storage rooms for general goods/non-hazardous items, the lighting needs to be reliable. The luminaires must be maintenance-free and achieve a certain level of light output. 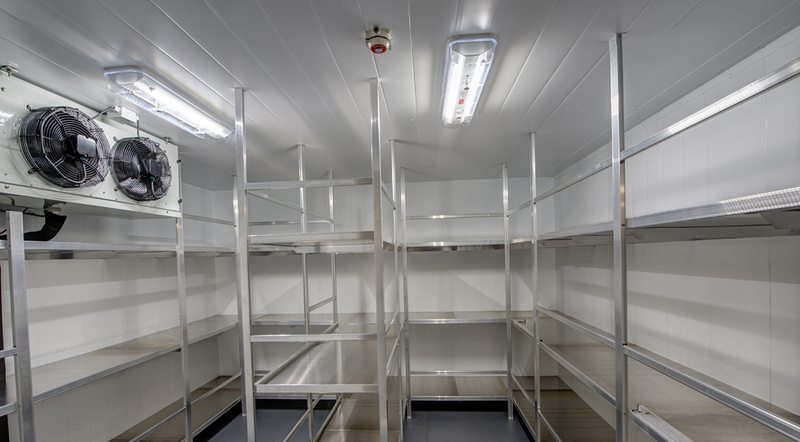 Lighting in cold- and freezing rooms should provide a safe working environment by achieving a certain level of light intensity even at low temperatures. In addition, low power consumption is required in order to minimise the cooling required due to the heat emitted from lighting. 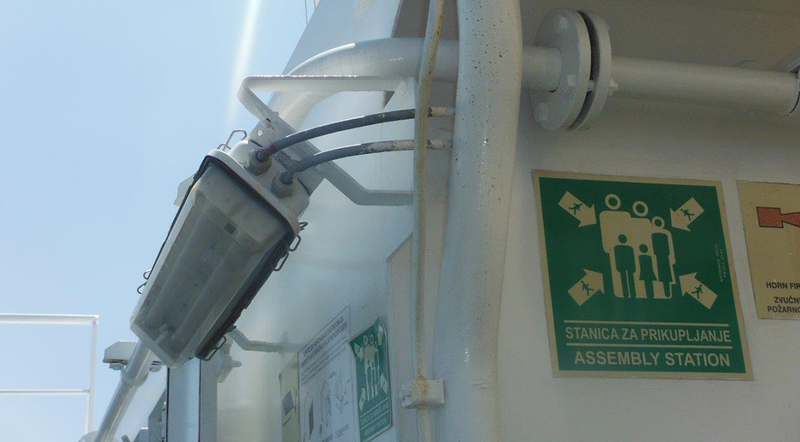 Lighting in paint storage areas on cruise vessels should provide a safe working environment. The lighting needs to be reliable and the luminaires must be maintenance-free and achieve a certain level of light intensity. 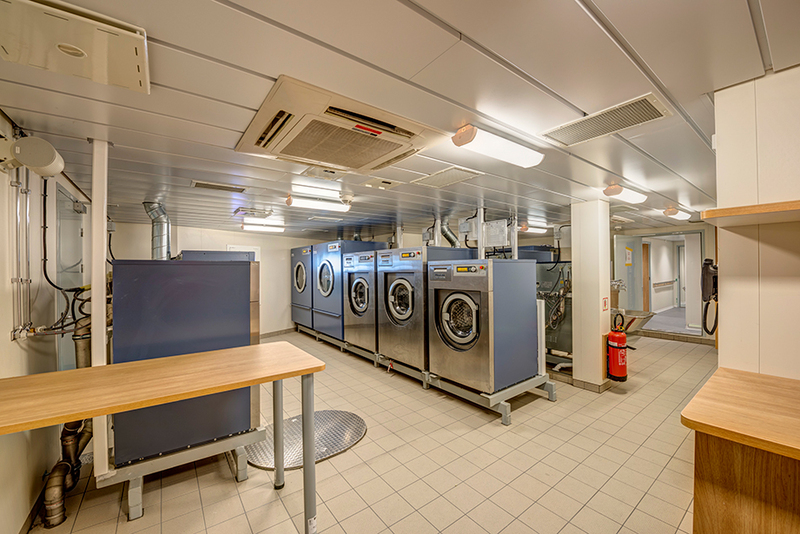 The laundry room on a cruise vessel should combine functionality with robustness. Not only should the crew be able to differentiate between different colours, it is also important to ensure the quality and water-resistance of the light fittings. 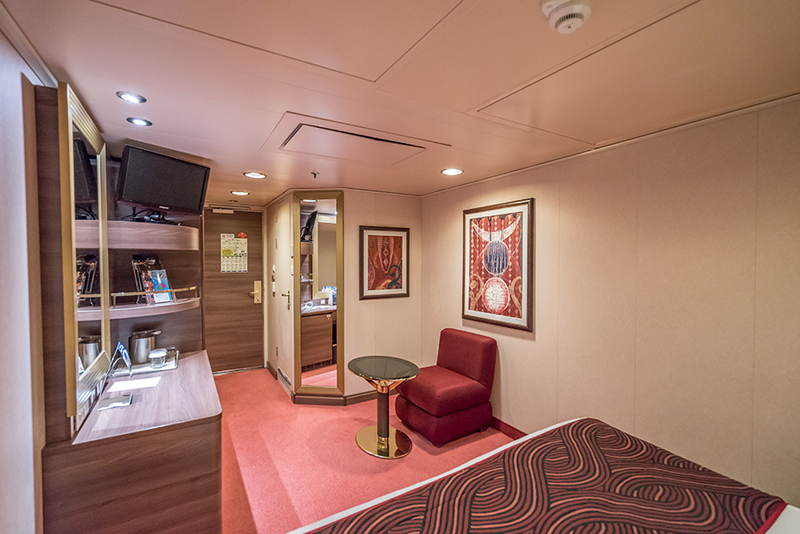 Crew cabins on cruise vessels are designed for both comfort and functionality. 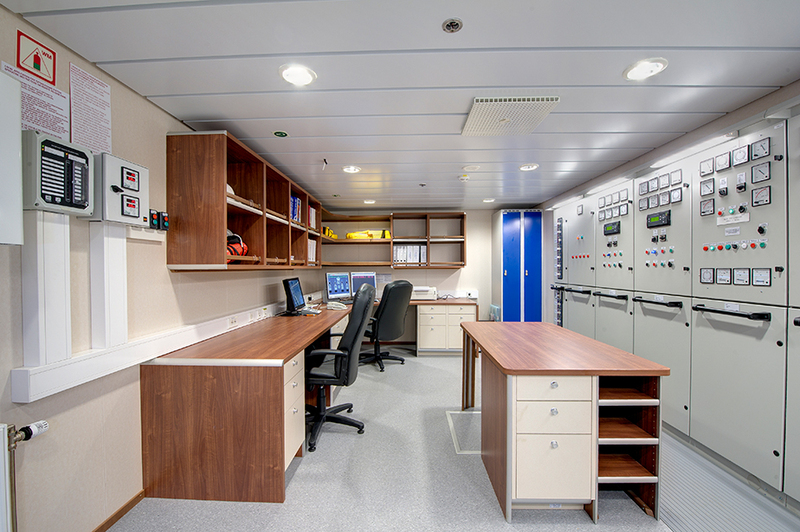 On the one hand, the crew should be made to feel comfortable in their living quarters, but equally, it is important that staff have an effective lighting system that enables them to organise their personal belongings in the cabin. 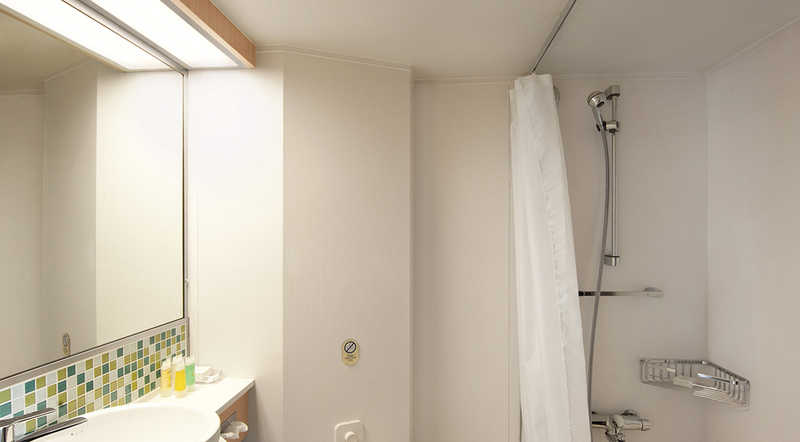 The crew bathrooms on a cruise vessel combine functionality and comfort in one package. Not only should the crew feel comfortable in the room, it is also important to ensure the quality and water-resistance of the light fittings. Lighting installed in crew corridors on a cruise vessel must be designed to provide a combination of functionality and safety. Lighting in corridors is often underestimated. 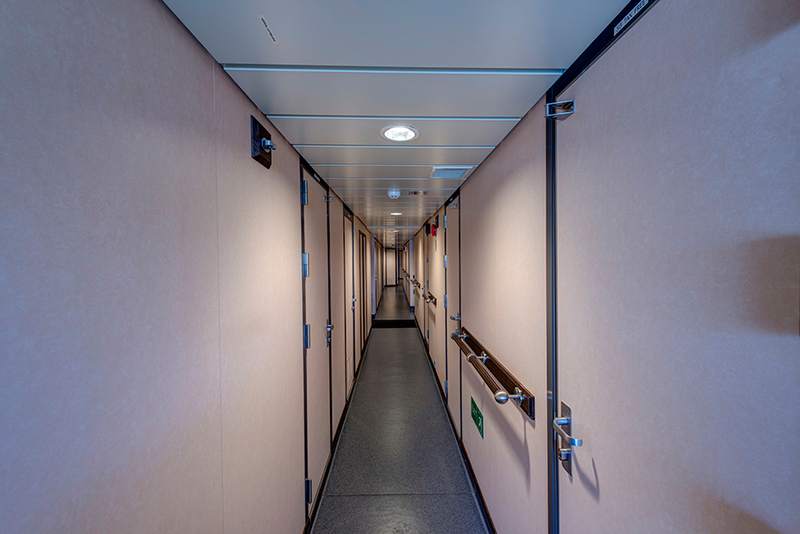 The function of corridors is not only to provide connections between rooms or different areas of a ship, but they must also function as main escape routes in case of emergencies. 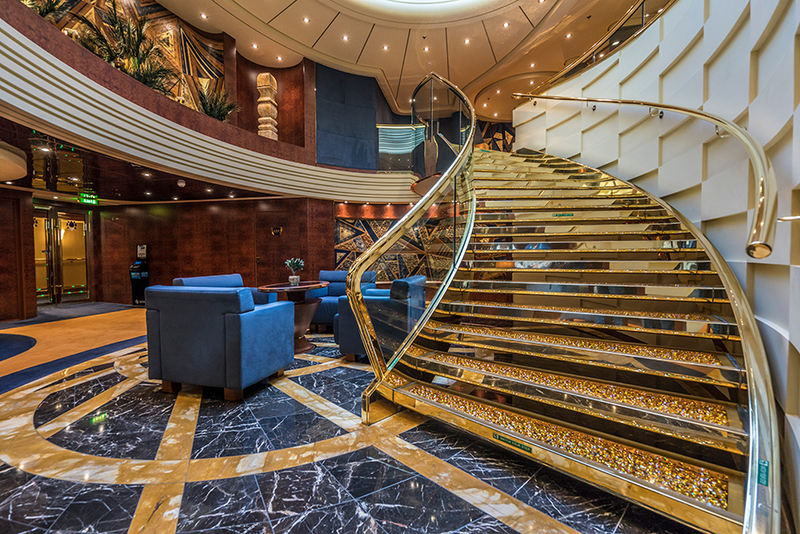 Lighting installed in crew staircases on a cruise vessel must be designed to provide a combination of functionality and safety yet still match the overall design. Lighting in staircases is often underestimated. 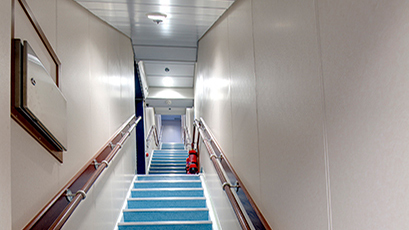 The function of staircases is not only to provide connections between the different decks of a cruise vessel, but they must also function as main escape routes in case of emergencies. 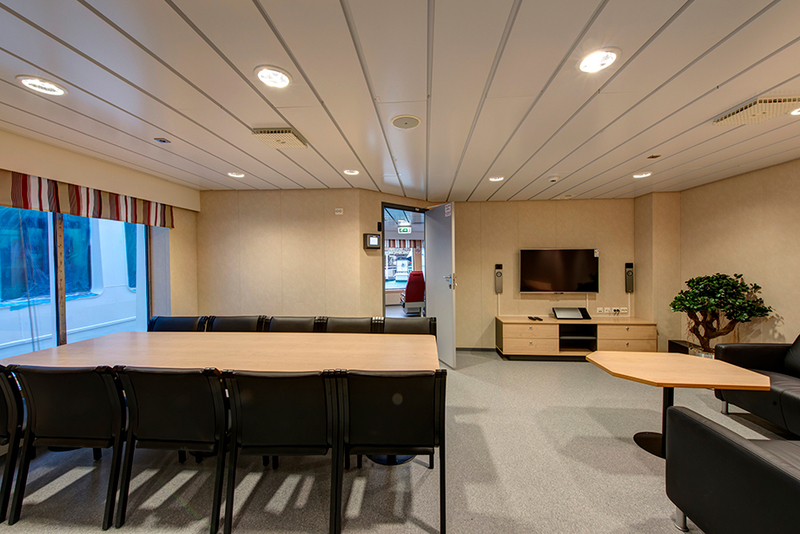 On a cruise vessel, the mess and lounge areas should provide a combination of comfort and functionality. 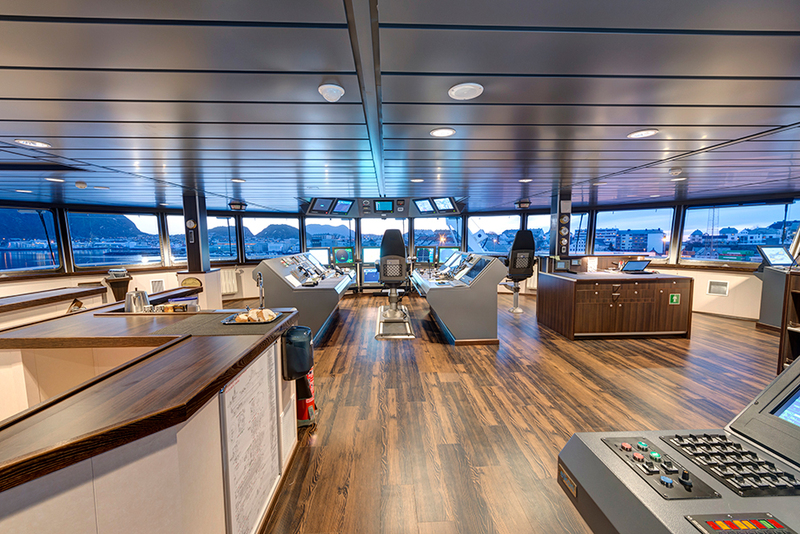 Not only should the crew be made to feel comfortable in the lounge area, it is also important that they have an effective lighting system in the mess area. Almost all cruise vessels have a crew recreation area that often includes a gym facility. Health and physical fitness are becoming more and more important for people. Staying in the crew recreation area offers crew members somewhere to relax and recharge their batteries after a long working shift.